The Russian school of liquid fuel rocket engines manufacturers GRD (жидкостных ракетных двигателей, ЖРД) which was chaired for a long time by V.P. Glushko aims at using the maximum of the chemical fuel energy and the maximization of the specific impulse (quotient between the thrust of a propeller, and the product of the mass output of propellant by the normal value of the acceleration of the gravity). Today the thrust of the GRD engine is 100-800 t. Because engines work at sea level, the pressure of the products of combustion at the level of the buzzard is limited: it cannot be much more lower than the atmospheric pressure. It means that to increase the specific impulse it is necessary to increase the volume of products combustion in the buzzard. The powerful GRD engine of the first stages takes into account this characteristic by increasing of the pressure in the combustion chamber. fig1: pressure in the combustion chamber according to time. fig2: specific Impulse according to the combustion degree of gases in the buzzard. We can observe the behavior of a high pressure solution( fig.1 ) and the maximization of the engines's specific impulse ( fig.2 ) of NPO Energomash with regard to their foreign counterparts. According to diagrams we see that a bigger pressure in the combustion chamber of the Russian GRD engines allows a better products combustion in the buzzard, and thus, increasing of the specific impulse and the thrust of the engines. So, GRD engines are installed on all Russian space rocket and on some strategic rockets. The implementation of the high pressures imposed the used of the closed cycle instead of the open cycle. The difference between those 2 principles is that in an opened cycle ( fig.3 ) the 2 components (the oxidizer and the fuel) are given by pumps to the combustion chambers in the liquid state. Furthermore, a small quantity is taken and steered towards the gas turbine to be able to activate the various pumps, then these gases are ejected. 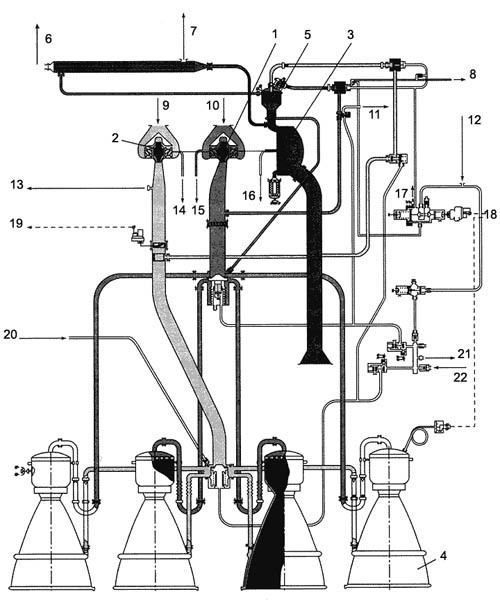 The main example of the GRD opened cycle are the RD-107 and RD-108 wich use as fuels liquid oxygen and some petroleum, they are installed on the rockets Sputnik, Luna, Vostok, Voskhod, Molniya, Soyouz, as well as engines using some acid nitrogen for the rockets Cosmos, Tcyklon, and the others strategic launchers. Engines with opened cycle have a pressure of 50-80 atm in the combustion chamber. The supplementary increase of the pressure is ineffective because of the losses of growth of the specific impulse caused by a not total use of the chemical energy of fuels. In engines with closed cycles ( fig.4 ) components burn completely in the combustion chamber. One of them, for example the oxidizer is sent to the gas turbine by the pump, there it is melted with a small quantity of fuel, the process of combustion is not total to insure an acceptable temperature of functioning for the turbine. Later, these gases go to the main combustion chamber where they are added with the rest of the fuel. In this type of engines all the chemical energy of the fuel is used and allows to increase the pressure in its maximum. Today the level of the pressure is 150-270 atm. The idea of an engine with closed cycle was realized for the first time in 1950 in the IRS (at the moment ФГУП " The Scientific center M.V. Keldysha "), about the engines of great thrusts (150 t at sea level) with a high pressure in the combustion chamber (150 atm) they were realized in the middle of the 60s in ОКБ-456 (at the moment НПО "Энергомаш"). The fuel used in this engine, RD-253, intended for the first Proton rocket was nitrogen tetroxide (N2O4) and unsymmetrical dimethylhydrazine (UDMH). On the Proton rocket the first floor included 6 RD-253 engines, which have already made 300 flights, but the engine is still unequalled today in its class for its energetic characteristics. The use of the closed cycle and the high pressures to increase the specific impulse became the main direction for the elaboration of the Russian GRD engines for spatial and strategic launchers. So, on the P-36M Satan rocket is installed the RD-264 engine with a chamber's pressure of 210 atm, but on Zenit and Energia rockets RD-171 and RD-170 engines have a pressure in the combustion chamber of 250 atm. The advantage of this kind of engines is that they are ecologically sure, have a high level on functioning, have a good flexibility of use and consume cheap fuel, such as oxygen and petroleum. 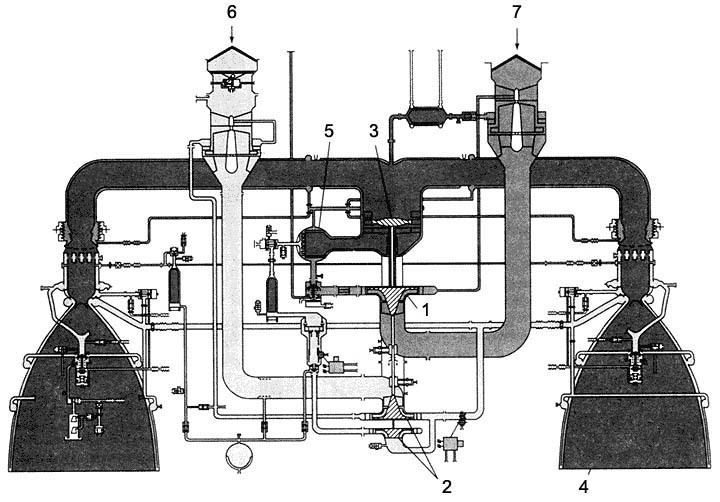 fig5: scheme of the universal combustion chamber. 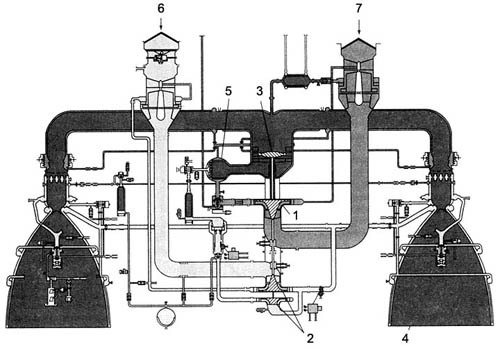 The universal combustion chamber of the RD-170 engine of 200 t of thrust is shown on the drawing 5. In the cylindric combustion chamber, of 380 mm diameter, burn 0.6 t of fuel per second in a pressure of 250 atm. Studies were led to exclude in a sure way the instabilities of combustion at high frequency in this chamber. Indeed the initial zone of admittance and combustion where vibrations are created generally in high frequency is divided into 7 identical volumes thanks to anti-vibratory partitions. Nozzles are placed such a way that their oscillation frequency is far from the echo frequency of the combustion chamber. The anti-vibratory systems implementation in the combustion chamber of the RD-120 engines of the Zenit rocket as well as the modernization of the RD-107 and RD-108 engines of the Soyouz rocket confirm the high safety and the efficiency of the found solutions, which will certainly be reused for the future RDG. The cooling system also benefited of all the experiment of the Soviet engineers. In particular the internal cooling is done by 3 zones of spray. About 2 % of the fuel is injected into it by droplets to protect the buzzards of the extreme temperatures ( 50MW / min ). Such a chamber demonstrated its high working capacity on RD-170 and RD-171 engines in a wide range of parameters (from 30 to 105 % of the pressure of the fuel) during 25 tests before the production. In the creation of the RD-170 engine, the most powerful, many problems appeared. Pumps responsible for the supply of chambers in fuels were subjected to strong constraints, pump in one stage for the oxidizer and the pump in two stages for the fuel. The pump for the oxidizer work at 14 000 trs / min under a pressure of 600 atm, the pump of fuel of the first level was at 500 atm and the second stage one at 800 atm. To ensure the functioning of pumps the gas turbine had to develop a power of 190 MW. Which is twice as powerful as the driving group of the atomic icebreaker "Arctic". To increase the resistance of the oxidizer ducts on the oxidation and on the heat (for the warm ducts) a nickel alloy was applied.